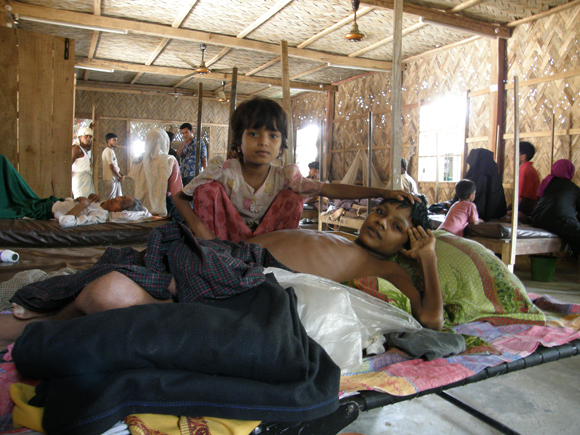 When Abdullah arrived, he had no motor function in his legs and had also developed bed sores from his stay at the hospital in Cox’s Bazaar. As is the custom in Bangladesh, his mother and younger sister stayed with him in the ward as ‘attendants’, feeding him, turning him over and helping him wash and go to the toilet, while MSF staff treated his injuries. Within a couple of months, Abdullah began to regain function in his legs. He was also able to receive antibiotic treatment for a urinary tract infection and the bedsore on his back healed well. The two remaining bedsores under his knees needed more intensive treatment, however, and there was still no improvement in the motor function of his upper limbs. After discussions with a physiotherapist at Handicap International, it was decided to refer Abdullah to the Centre for the Rehabilitation of the Paralysed (CRP), where he could receive physiotherapy to help with his motor function and skin grafts to help treat his remaining bedsores. His medical bills at the CRP were to be footed by Handicap International. Dr Stille remembers this story in particular as it is a great example of two NGOs with different specialties working together to provide the best possible care for a patient severely in need of medical assistance. Kulsuma was a 20-year-old mother of two. She was admitted to the inpatient department in Nayapara after suffering acute heart failure. Without surgery and specialist care, Kulsuma’s life expectancy was a few years at best. Read the full story.